The Basic School for Marine Officers is reeling from a cheating scandal that involved six second lieutenants accused of wrongfully obtaining and sharing key grid points for the night land navigation course. The officers were accused of sharing the grid points via text messages ­before the test and later relying on them to find hidden boxes stashed across the wooded night land ­navigation course in Quantico, Virginia, ­according to interviews with Marine Corps officials and a copy of the command investigation obtained by Marine Corps Times. 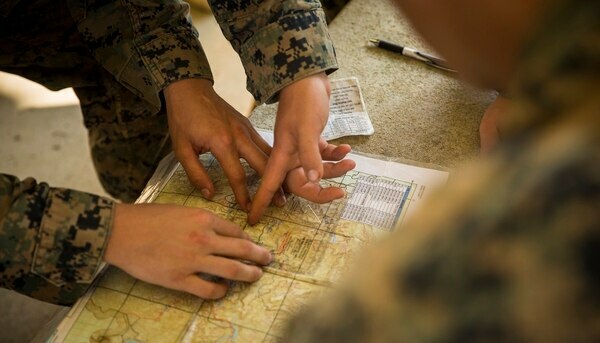 The Marine Corps considers that cheating because the students were able to complete the course without demonstrating the key skills the course aims to evaluate: conducting proper land navigation. To make matters worse, the investigation of the six second lieutenants was mishandled and resulted in an investigation of the investigators. The episode was further complicated by the alleged illegal confinement of ­female officers and allegations of ­sexual harassment. In the end, ­numerous Marines faced discipline and one Marine’s claims of innocence led to a private polygraph test. The six officers accused of cheating are now facing administrative separation and two captains who conducted the initial investigation have received nonpunitive letters of reprimand, or NPLOCs. Meanwhile, top officials at TBS are making some changes to the course to eliminate the chance of similar problems in the future. It all surfaced with a Dec. 5, 2017, complaint from a student who said a small group of his peers cheated on night land navigation exam portion of instruction. The TBS command launched an investigation and the students, interviewed one by one, began to rat each other out. The original source of the grid points for the boxes came from a Marine who had been recycled in training and obtained some of the coordinates from his time with a previous company. That Marine was enrolled in follow-on course with a new cadre of newly minted officers. Investigators also uncovered a confiscated cell phone and series of scandalous texts between alleged co-conspirators attempting to seek grid coordinates. “Rah deleting immediately after,” read one text sent from a second ­lieutenant to the recently rolled back second lieutenant, struggling to meet the basic requirements aboard TBS. The first student sending that text admitted to investigators that he had asked for and received the grid coordinates, but he also denied using them while taking the test because he believed they were “unreliable,” according to a command investigation obtained by Marine Corps Times. One of the other alleged cheaters, a female second lieutenant, with the assumed name Lt. Delta, confided in the other student she “could pass Final Night Land Navigation by plotting the boxes beforehand,” according to the command investigation. The female lieutenant spoke to Marine Corps Times on condition of anonymity. According to the TBS Student ­Academic Integrity Policy, it’s a violation for students to obtain coordinates of the boxes that dot the land nav course. Graded events also are strictly ­conducted as an individual effort, which means students can’t seek assistance from each other to complete the event. Day and night land navigation events aboard TBS are conducted differently. For day land nav, students are given grids to boxes they must plot on a map then locate in the Quantico woods using terrain association or following a lensatic compass azimuth. For night land navigation, students are brought to a starting point and are given an azimuth and distance, but no grid coordinates. The idea here is that students use their compass to find to their location. Training Command told Marine Corps Times that prior knowledge of the coordinates could make it possible for a student to identify the marked boxes on a map without using the skills the course is designed to test. The ringleader that brought the whole conspiracy crashing down was a student from a previous TBS class who allegedly obtained some of the ­coordinates from his previous class. That student, who ranked near the bottom of his class, was recycled to Phase II of TBS “especially do to his poor performance leadership performance,” said a letter from his previous company’s executive officer, dated August 2017. Another second lieutenant, who already graduated from TBS and is now attending a follow-on school, also was caught up in the cheating turmoil after investigators discovered text messages linking him to cheating on a different land navigation event. The investigation recommended administrative separation for that Marine officer as well. And another second lieutenant received an administrative nonpunitive letter of caution, or NPLOC, for failure to report cheating after Lt. Delta told her she could locate the boxes. Several students are still fighting to clear their names. They are highlighting what they view as wrongdoings carried out by TBS during the investigation. One of the two female officers ensnared in the ­cheating scandal, Lt. Delta, accused other TBS officers of gender discrimination during the investigation. She said she was kept in illegal pretrial confinement for nearly 24 hours. She alleges that led to her giving a statement under duress to investigators admitting that she received grid coordinates to the land nav event. Lt. Delta eventually filed an equal opportunity complaint over the alleged mistreatment, prompting the Marine Corps to launch a separate investigation into how the cheating investigation was handled. Two of the accused land nav students — both females — were “directed to sit in separate conference rooms by a TBS staff member and await to be questioned about the allegations of misconduct,” Training Command said in a statement to Marine Corps Times. And one of those female officers was left in the ­conference rooms all night. The command investigation “concluded that it was only coincidental that the two neglected students were female,” according to the document. However, in an interview with Marine Corps Times, Lt. Delta pushed back on the assertion that her ­confinement was merely a miscommunication. She claims that the two captains who ordered her to stay in the conference room likely informed her unit of her absence from evening formation, otherwise she would have been marked an unauthorized absence. Lt. Delta said the failure of any unauthorized absence reports from evening formation means the captains were aware she was still in the conference room when they secured for the evening. Yet the command did find some fault with how those captains handled the incident and took administrative action by giving them NPLOCs, according to the command investigation. But Lt. Delta and her lawyer, Mike Hanzel, argue that the confinement wasn’t even the most egregious act against her. Before the entire land navigation situation ­happened, Lt. Delta had filed a restricted sexual ­assault allegation, in November 2017. She was ­assigned a uniformed victims advocate, another Marine who is trained and assigned to provide support to sexual assault victims. It turns out that her unformed victim’s advocate eventually became one of her interrogators during the land navigation investigation. It’s highly unusual and inappropriate for the same person to be assigned to both support a sexual assault victim while also investigating that victim for ­unrelated misconduct, said Lydia C. Watts, who heads the Service Women’s Action Network. The uniformed victim advocate’s role is “to provide ongoing support to service members who have been sexually assaulted and making a UVA part of an investigation of a victim, even if it is on an unrelated matter, destroys the trust victim’s place on their UVA to be looking out for their best interest when they report an assault,” Watts told Marine Corps Times in an emailed statement. Marine Corps Times has learned that Lt. Delta’s victims advocate eventually was reassigned after ­complaints were made about his participation in the land navigation investigation and his simultaneous role as her sexual assault victim’s advocate. “The Marine Corps takes allegations of sexual ­assault seriously and Uniformed ­Victim Advocates are specifically selected for their maturity and ability to deal with sensitive situations,” Training Command said. Lt. Delta also made a sexual ­harassment ­complaint against one of the investigators, but according to ­Training Command those allegations were ­unsubstantiated. And adding to the mess, Marine Corps ­investigators found sexually explicit text messages pulled from a confiscated phone that suggested a ­romantic affair between Lt. Delta and one of the other ­students accused of cheating on the land ­navigation course. Some of the students believed this was tacit approval to have and plot the grid coordinates. “In his statement to the IO [Investigating Officer], [the land navigation instructor] noted that his presentation to the students included an orientation slide with a rough, not-to-scale depiction of the course. He said that he cautioned the students against trying to plot the boxes as depicted in his brief, warning them that those efforts would fail,” the command investigation reads. Officials TBS told Marine Corps Times that the school is now ­making changes to clear up any potential ­confusion regarding the rules of the night land nav course. Yet Training Command continues to claim that no instructor at TBS ­authorized students to plot coordinates for night land nav. “Coordinates are not provided to students at The Basic School for night land navigation,” Training Command said in a statement. Land navigation boxes will be repainted before each company conducts night land navigation and additional unscored administrative boxes will be scattered across the course “to prevent students’ attempts to map the course prior to execution,” the investigation stated. Despite missteps during the ­investigation and some substantiated misconduct of two captains associated with the investigation, Training Command and The Basic School stand by its findings. Yet Training Command continues to claim that no instructor at TBS ­authorized students to plot coordinates for night land nav. According to the command investigation, TBS will now make two explicit restrictions prior to the night land navigation course. Despite missteps during the ­investigation and some substantiated misconduct of two captains associated with the investigation, Training Command and The Basic School stand by its findings.